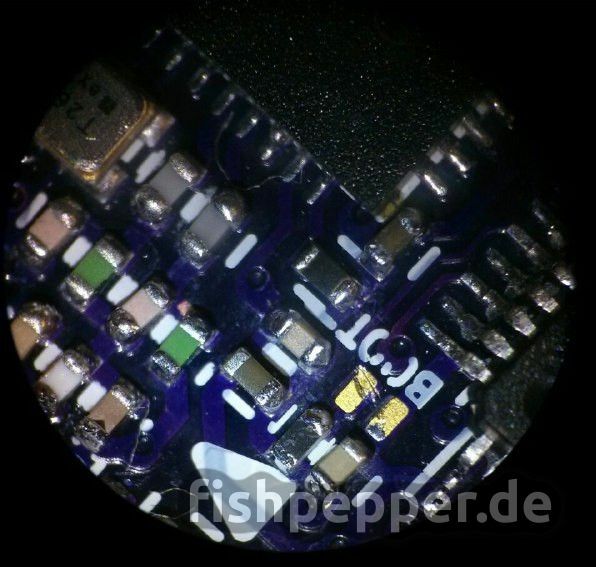 When building my tinyFISH fc and the tinyPEPPER ESC I was faced with soldering 0402 sized components. That is quite tricky to do manually, a stereo microscope helps a lot! Do not go for a monocular scope, 3D relly helps a lot. As this is just a hobby project and I am running on a tight budget, I was looking for a cheap microscope to get the job done. I found the AMSCOPE-KIDS SE120 at the reduced price of $50 — great! Shipping and tax to germany adds another $50, but still, it is remarkably less than i would have to pay for a professional version. UPDATE: You can also buy a clone of this scope on Amazon germany. See this link. Might save you some money when you order from europe. When it arrived i was impressed, for this price tag it works very well. Working distance is ~7cm, enough to be used for soldering. The picture on the right was made with my cellphone through the eye piece, the visual impression is even better when seen with your own eyes. Nice read! I noted that the same or identical microsopes are available from within EU. Thanks for sharing this! I will update the post!